? All-In-One Survival Tool Set - This is the one tool true survivalists, preppers, hunters, backpackers, hikers and campers MUST HAVE in their arsenal for taking on the outdoors. Use the multifunctional tools for basic functions such as a Shovel, Hoe, Axe, Saw, Hammer. Unscrew the connecting tubes to reveal the hidden Rescue Knife and Saw, Emergency Whistle, Bottle Opener and Fish Scaler Knife. It can be used either straight or at a 180 degree angle, to cover all your different needs. ? Sturdy & Durable - This shovel is made of 420 high quality alloy steel and surface oxidation treatment, the thickness is 0.18cm, which is high-strength and wear-resistant, effectively prevent rust, suitable for a variety of harsh outdoor environment. Deep-thread rubber anti-slip grip designed, reduce the friction of the opponents during use, comfort and safe. ? Extension Bars - You can choose the length of shovel (13.38", 18.5" and 24.41") by adding less or more extensions. ? Compact & Easy To Carry - This shovel folds down to 7.48 inches and has a carry case so your gear won't get dirty. It only weighs 1.65 pounds, easily fits into your pack. ? Multifunctional - Ideal for camping, hiking, snow, self-defense, backpacking, fishing, hunting, gardening outdoor activities. Also great for anyone to use, gardeners, survivalists, hunters, hikers, campers. 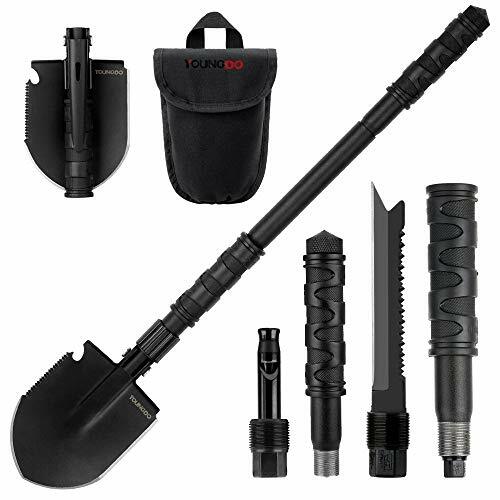 This Folding Shovel is also an ideal entrenchment tool for Field Survivalists, Disaster Recovery Staff, Truck driver.